Red Sands is a 5 reel 20 payline that is a straight forward type of game with nothing fancy. The game is available in two forms. There is the flash version of the game and the downloadable version. For the flash version, the player can only use USD while the other version allows for more currencies. The minimum bet for all lines is 0.20 with the maximum being $100. This makes thegame accessible for people who are willing to pay with pennies as well as those that are more seasoned and wealthy. The Red Sands slot machine has a total jackpot of 10,000 credits. This jackpot is achieved with 5 kangaroos on one of the lines. There is a secondary jackpot of 3,000 credits that occurswith 1 kangaroo and 4 koalas. 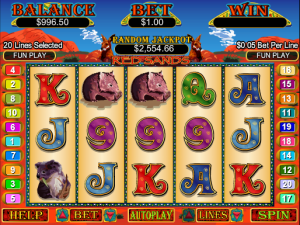 Four wombats and one kangaroo grants the player a jackpot of 2,000 credits. The Kangaroo is the wildof the game and can create a winning combination with other symbols. The only piecethatis not replacedis the Moonscape symbol, which is a multiplier. With at least 2 multiplier symbols, you can get a multiplication worth x2, x4, x10 or x50. At least two Moon scapes can trigger a free spins feature. The moonscapeareon the reels while the player gets to play ten freespins. The kangaroocan be a substitute for moonscape. You can win up to 10,000 credits if you hit 5 of thesein a spin. The overall presentation of the gameis very simplistic. There are no elaborate animations. The only piecethat gets animated is the kangaroowhenthe symbol appears.The game is very easy to play with no lags and loading problems. The gameruns smoothly, and that is the most important part. This gamemay not be the fanciest game, butthis is easy to play.